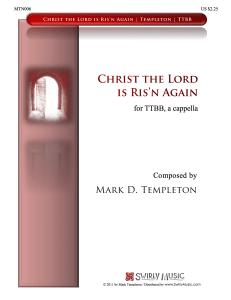 For TTBB chorus, a cappella. This arrangement is a medley of Come Thou Fount, What Wondrous Love, and Be Thou My Vision. The first two tunes can be found in William Walker’s Southern Harmony (1835), and the latter tune is taken from a traditional Irish ballad. These songs are deeply rooted in early American culture, and can still be heard today in churches and at community gatherings of shape note singing. The words and melodies were a part of my upbringing, and I have a very strong emotional connection to them. They would often be sung at the little country church that my grandfather pastored in Ohio. The opening mixed meter phrases of 7/8 and 8/8 are challenging but fun, and they contrast well with the slower medieval sounding phrases of What Wondrous Love. The ending climaxes intensely with an extension of the opening statement. Your men’s group will enjoy singing this medley.